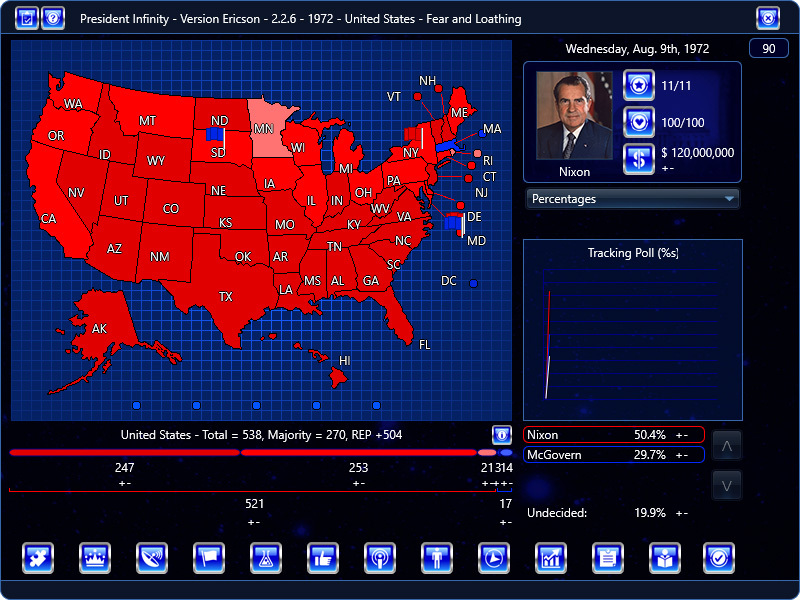 President Infinity will soon have United States – 1972 – Fear and Loathing added officially. I’m so glad another historical campaign is out. I haven’t played it yet, but I looked at the candidates, and it would be nice if it had more “OFF” candidates for what-if scenarios. I’d also recommend balancing the parties a little more, if the polls can justify it. The American Independent Party could be added as they got over 1% of the vote nationally which was over 1,000,000 votes. Nixon’s leadership from 5 to 4. His integrity should be 2 instead of 1, at this point. I’d agree with a 5 for experience, though. Ashbrook’s leadership and charisma from 1 to 2. McCloskey’s integrity from 5 to 4. McGovern’s integrity should probably be a 4. I think his issue knowledge should probably be 3 or higher, and not a 2, considering he was a leading Senator. He was one of the major senator of the election reform that was implemented in 1972. Humphrey’s integrity should probably be reduced to a 3, after he won last year’s nomination without attempting to use the primaries, and won it only through backroom deals. Experience and issue knowledge I’d make a 4, instead of 5. Wallace’s charisma would probably be a 3 or 2, since his party was moving away from him. He’d only be charismatic to other racist Southerners. Muskie’s debate should probably be a 3. McCarthy’s first name should probably be listed as “Eugene.” His experience should be a 4 at this point. His debating should definitely not be a 2. He was exceptionally intelligent and had the support of the intellectual elite, many of them his personal friends, of the Democratic party in the 1968 election. Scoop Jackson shouldn’t be a 1 in debate. He’s not Sarah Palin. Sanford shouldn’t be a 1 in charisma. He’s not a misshapen dwarf. Yorty shouldn’t be a leadership and debate of 1. Mills shouldn’t be leadership, integrity, charisma and debate of 1. Experience 5 and issue knowledge 5 doesn’t make sense either. How can you have that much experience and issue knowledge and be a 1 in debate? That’s like having a debate with Stephen Hawking where he can’t use his machine. Hartke has too many 1’s and 2’s. Kennedy should probably be leadership 4, integrity 2 (if he had a 1, he’d probably never get reelected to the senate), debate 4. Overall, the scenario looks great. I’d like to see more candidates and have the candidate abilities using the same scale that Anthony uses on his scenarios, which are the same that I’ve used for 1788-1956. 1’s and 5’s should be rarely and sometimes never seen in a scenario. Whereas, the majority of the numbers should be a 3, which is average. So glad more historical campaigns are coming out! Keep them coming! The next one should be 1960. Yes, 1960 is a good idea. 2000 is also at the top of the list. Ya, 1. 2000, 2. 1960, 3. 1992 is a good ordering for next historical post-1960 campaigns. We’ll see. 1992 is a bit tricky because Perot came into the race, then left, then came back, so it will require a game engine change to allow this. @anthony well 1960 is just as tricky with faithless electors. You’re right, 1960 has its own quirks. In 2000, there was also a faithless elector plus the whole Florida controversy. It would be nice if there was a way to model faithless electors. Yeah faithless electors would be a great feature. This could be done by a model which includes something like a party base approval rating. e.g. 0-100 which is affected by actions you do in the game. Let’s say when it’s below 50, as it is by Trump for example the danger for faithless electors or brokered conventions should increase. If the convention becomes brokered there should come up the option to run as an independent, running as the VP (if selected) or suspend your campaign. Btw I was thinking of another feature: playing as the Vice President. For example when I play as Rubio and I am subsequently selected as Trump’s VP I play the campaign as Trump to an end, although I started as Rubio. It could be fun to actually play the game as the VP when you were selected. I probably am too liberal when it comes to skills. Thanks for giving me a reality check bro. I’d also add Gerald Ford as a VP possibility. You should do 1988 as a scenario. Yes, but it would take a lot of work to implement. @Anthony – General 2016 problem — I started the game with the normal Republicans (the ones you normally start with that is). I turned off the Democrats who were running in reality. Turned on a few Democrats who were not on by default. The Republicans start the election with nearly 100% when you look at the screen for the general election. I also still think you have the polling backwards for the primaries. Normally, you start off with Clinton, Sanders, Webb, O’Malley. If you turn off Clinton and Sanders but keep Webb, O’Malley and then add lets say Gillibrand and Warner, the result is Webb and O’Malley skyrocketing to 50% each (pretty much). This is more unrealistic than Gillibrand or O’Malley starting at zero. I get the access violation when I try to launch the scenario, no idea why? On election night, it stops at 11:59 and Alaska’s polls don’t close. Quite annoying as I was playing as Kennedy leading Nixon 269-266 at that point! @Anthony – Further evidence that polling is wack in this game. Started Biden v. Trump — no other candidates are on, for July 2015 start date. Republicans have 80% to 10% for the Democrats. What? Yes, no ETA but it is getting fairly close.